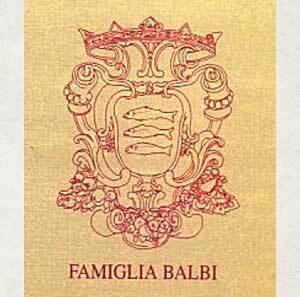 The Genoese Balbi Family Crest (pictured) and other family crests can be found in the Balbi Family Nobility page. 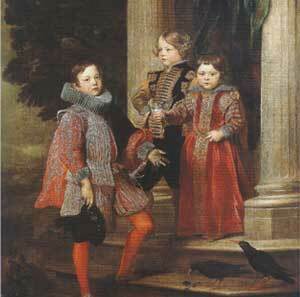 "The Balbi Children" by Anthony Van Dyck, 1625-27 - The National Gallery, London is featured on the art page. 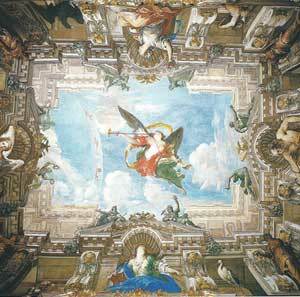 "Fame of the Balbis" a ceiling fresco by Valerio Castello and Andrea Sighizzi is in the Palazzo Reale and is featured on the residences page. The courtyard at Palazzo Reale is featured on the residences page. 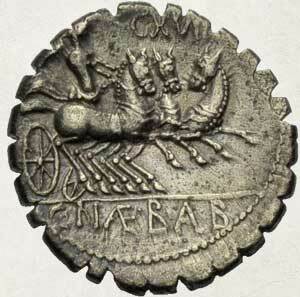 The "tail" side of a coin minted in the honor of L. Naevius Balbus. Learn about him and more famous Balbis. The Balbi family of Genoa is famous for its many contributions during the Renaissance period to Genoese history and internationally, to the business environment. Beginning in the 1500s their family businesses included the import and export of silk, velvet, wool, mercury and ultimately, international banking. Through these business endeavors they achieved nobility status. Their family tree dates from the 1400s. The Balbis commissioned many portraits from Flemish artist Anthony Van Dyck, a personal family friend. In the 1600s the Balbi family sponsored the establishment of the street Via Balbi in Genoa where they built the Jesuit College and their residential palaces, some of which were designed by Italian architect Bartolomeo Bianco and sketched by Flemish artist Peter Paul Rubens. 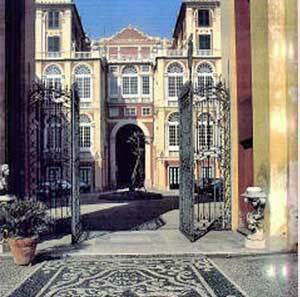 Today on Via Balbi the University of Genoa is located at the site of the Jesuit College and former Balbi palaces house a state museum and University of Genoa facilities. If you are a Balbi descendant, you can be added to the Today's Balbis page, a central location where more than 180 Balbis from 18 countries have posted their ancestral summaries. It is a helpful resource for Balbis who wish to find common ancestors. Another resource is the recently initiated Balbi family DNA research project which will combine genealogy and genetics to help Balbis find common ancestors.